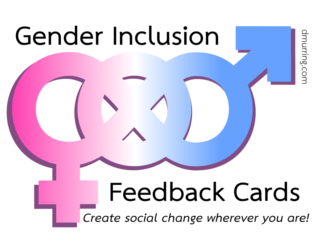 Note: I want to keep these cards accessible to everyone who needs them! The suggested price is $5, with tips appreciated, but if you can't afford that you can always get them for free by setting the payment amount to $0. 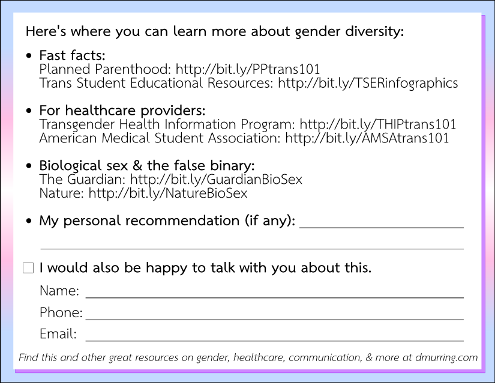 Let's face it: leaving comments on gender inclusion is kind of awkward. The person you're talking to probably won't follow what you're saying, let alone communicate it accurately to the right person. 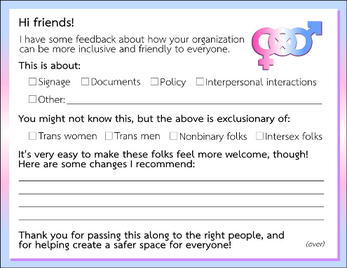 And, if you're the person being excluded, advocating for yourself can be hard! These printable feedback cards aim to make this whole process a lot easier and more effective! 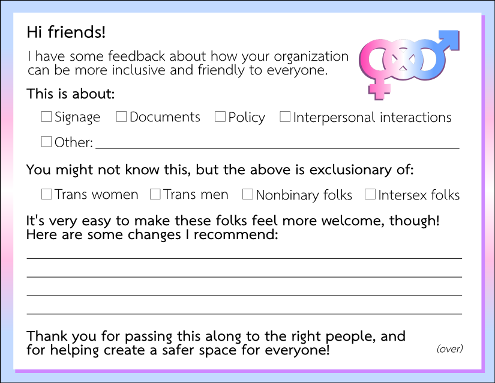 With easy checkboxes, places to leave comments, and links to resources on the back, all you have to do is pass these cards off to someone in the organization (you don't even need to talk to them!) and know that the things you want to say actually make it to the right person. Interested in buying pre-printed cards instead? You can join a pre-order right here! 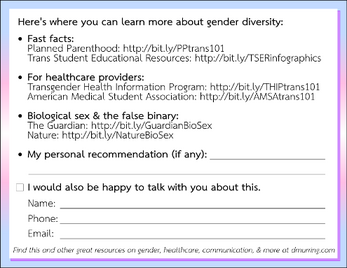 When you download these feedback cards, you'll be automatically subscribed to any updates I make. And if you have any feedback, I'd love to hear it! My work is always free, so your financial support is extremely valuable!